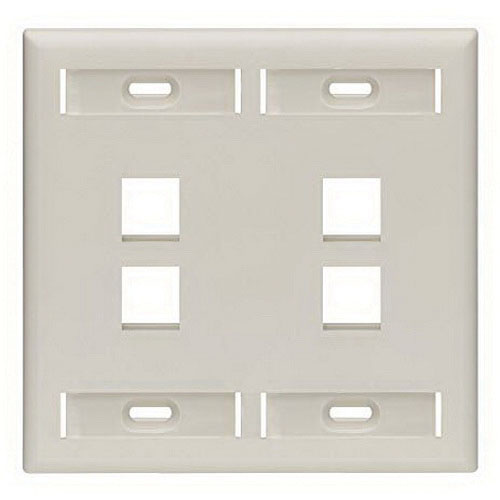 Leviton QuickPort® 2-Gang 4-Port multimedia wallplate in square shape, fits within minimum rectangular NEMA openings and accommodates low voltage box eliminators for a flush mount. This wallplate in light almond color, has high impact, fire retardant plastic construction for strength and durability. It comes with color matched wallplate screws for aesthetic appearance and easy installation. It measures 4.56-Inch x 0.925-Inch x 4.5-Inch. The wallplate can be flush/screw mountable. This wallplate includes ID designation windows for each wallplate. It is compatible with all individual QuickPort modules. 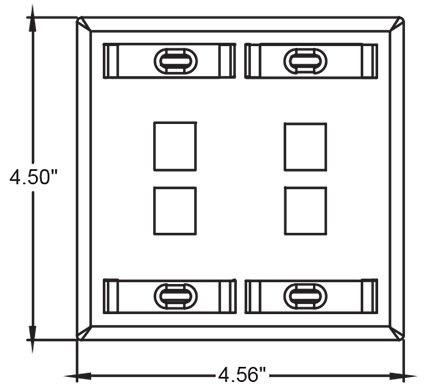 This wallplate is Ideal to use where port designation windows in a 1- or 2-Gang economical flush-mount housing is required. The wallplate meets cULus, CSA, FCC and ANSI/TIA-568-C.0 standards.